They are not dead. Restoration, by the "heat method," of those drowned or otherwise suffocated. New York : Wright & Schondelmeier, 1879. Description : advs., bt., [1 l.] frontis., -200 p., xlviii p., [2 l.] p., [4 l.] pl., advs. ; ill.: 1 phot., in-text figs., 8 col. lith. ; 20 cm. Photograph : stub-bound cabinet card, albumen portrait of the author. Photographer : Abraham Bogardus, (1822-1908). Subject : Physiology — Asphyxia. Author caption: By T. S. Lambert, A.M., M.D., LL.D. Author's edition has the photograph. Photographer's caption: Photographed by A. Bogardus, 18th St., & Broadway, N.Y. Elegant work at reasonable prices. Lambert wrote much of this book while he was in prison, convicted of perjury. The document deemed false was an 1876 affidavit that Lambert endorsed in his capacity as president of the American Popular Life Insurance Company, a company he led into bankruptcy. The conviction was later overturned because of the punctuation of the affidavit, specifically, the placement of a semicolon and the confusion it caused for the jury. 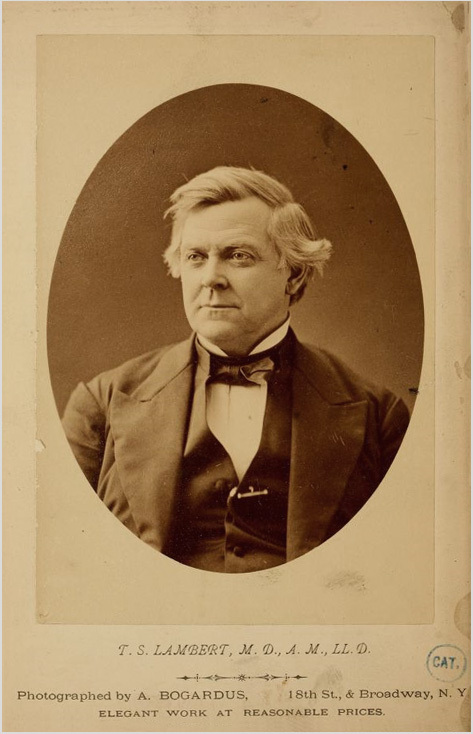 A highly regarded photographer, Abraham Bogardus was elected first president of the National Photographic Association in 1869 and held the office until 1875.